After a spectacular crash-landing on an uncharted planet, brash astronaut Leo Davidson (Mark Wahlberg) finds himself trapped in a savage world where talking apes dominate the human race. Desperate to find a way home, Leo must evade the invincible gorilla army led by ruthless General Thade (Tim Roth) and his most trusted warrior, Attar (Michael Clarke Duncan). Now the pulse-pounding race is on to reach a sacred temple that may hold the shocking secrets of mankind's past - and the last hope for it's salvation! 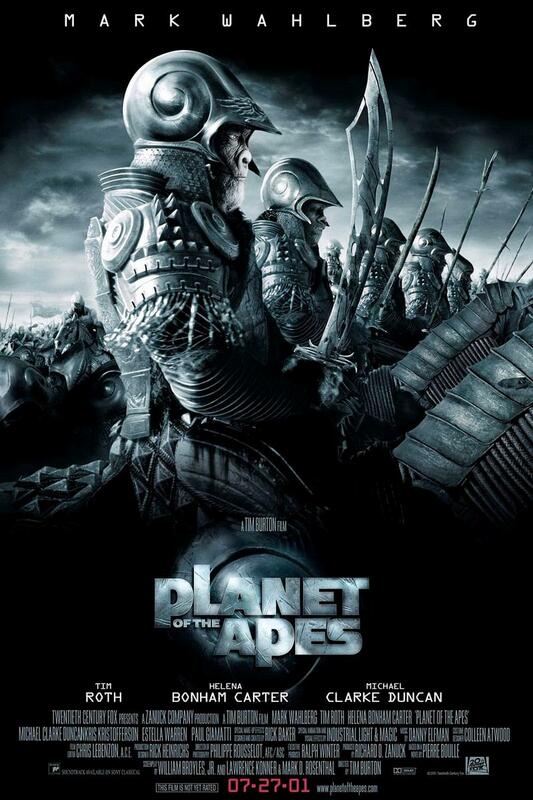 Based on Pierre Boulle's classic novel "Planet of the Apes," the premise for this film has become one of the most recognized and provocative concepts in the canon of science fiction literature and cinema. Visionary filmmaker Tim Burton (Batman, Beetlejuice, Edward Scissorhands, Sleepy Hollow) has taken Boulle's basic idea and built upon it a uniquely envisioned journey to an incredible upside-down world. Provided courtesy of 20th Century Fox. Rated PG-13. Running time: 119 minutes. Garnering a reputation for excellence and resourcefulness, Baker’s assignments became a diverse and iconic collection of creatures, including Harry and the Hendersons, Michael Jackson’s Thriller, Greystoke: The Legend of Tarzan, Lord of the Apes, Gorillas in the Mist, Coming to America, Gremlins 2: The New Batch, Men in Black, The Nutty Professor, Mighty Joe Young and How The Grinch Stole Christmas, to name but a few. In the year 2011, Baker won his seventh Academy Award for his contributions transforming Benicio Del Toro and Sir Anthony Hopkins into werewolves for The Wolfman. He supplied a new population of aliens for Barry Sonnenfeld’s Men in Black III and transformed Angelina Jolie in Maleficent. Baker received the 2485th star on the Hollywood Walk of Fame in 2012. Through all of his adventures creating monsters and characters, Baker remains a thoughtful, dedicated artist and devoted family man. Jeff has worked in many different areas of the film and entertainment industry, but is known primarily as an Art Director for films, commercials, and ride-show vehicles, as well as a theatrical Set Designer. Besides being a sculptor on Tim Burton’s remake of Planet of the Apes, Jeff worked at Disney’s in-house EFX company, Dreamquest on Con-Air, Flubber, Mighty Joe Young, Kundun, and as a lead model-maker on Armageddon. He was the Art Director on the cult film, Cyxork VII, as well as The Sci-Fi Boys, a documentary on Ray Bradbury, Ray Harryhausen and Forrest J. Ackerman. At Task Research, Jeff was involved in the sculpting and design of the DeLorean car for the Back to the Future Ride for Universal Studios. His other work at Task includes: Disney’s Flying Wing for the Indiana Jones stunt show, Earthquake cars for Universal Studios, the history-making Voyager aircraft, a 2/3 scale P-51 Mustang kit, and a documentary film on the development and construction of a proprietary aircraft for Lockheed. Jeff is an Ovation award winner for his theatrical design work, and is well known to theaters and theater patrons having designed and built over 150 productions from Santa Barbara to Edinburgh, Scotland. Jeff is also a theater director and producer. This September he will be putting up MARTIANS an Evening with Ray Bradbury, which he co-wrote and adapted from four of Ray’s classic Martian stories. Jeff is also the co-creator of Unbound Productions and its very successful flagship production, Wicked Lit, which does immersive theater in alternative venues, such as cemeteries, mausoleums, and haunted houses. Jeff teaches Production Design and Set Design at FIDM in Los Angeles.